In Mao’s China, it was not at all uncommon for the Party to expunge from official photographs people who were deemed either irrelevant or politically toxic — the objective being to highlight Chairman Mao and those who were seen as his loyal followers. Some interesting examples of these acts of rewriting visual history are documented in this 2013 post by Oiwan Lam. In the early 1970s, as Lin Biao and Peng Dehuai fell into disfavour, they were systematically scrubbed from photographs with Mao. This week we have an interesting contemporary example of this kind of image scrubbing for propaganda purposes. But the erased is not a political leader in disfavour, but rather a celebrity in the midst of scandal, and therefore deemed morally unsuited to appear in a prominent program on Beijing TV to celebrate the Spring Festival. Also this week, readers should note how the Chinese Communist Youth League is discussing its own propaganda efforts over the past year, and the need to leverage social media platforms and other emerging media to find new ways to reach young people with the Party’s messaging. 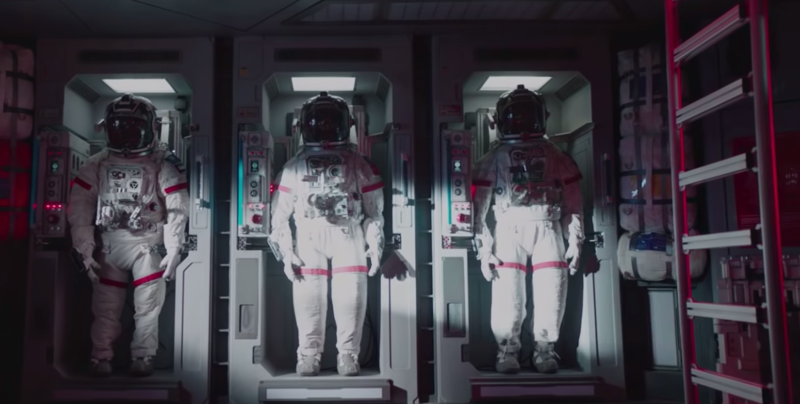 Worthy of attention, too, is the discussion taking shape in China around the release of the science fiction blockbuster film “The Wandering Earth.” To what extent does the film pander to nationalist sentiment, going against the work of short fiction that inspired it? Beginning on February 5, the Central Committee of the Chinese Communist Youth League (CCYL) began running reviews on its official WeChat account of how the League, nicknamed “Tuan Tuan” (团团), engaged with audiences over the past year through various social media channels. The point of the reviews is apparently to highlight the work the CCYL has done to modernise propaganda and reach younger audiences with the messages of the leadership. The CCYL’s top-ten list of songs over the past year consisted entirely of patriotic songs, including “Born Unbending” (生来倔强), a tune produced by the CCYL-operated China Youth Workshop (青微工作室) about military maneuvers in the South China Sea. Such public acts of taking stock of the implementation of Party policies are common in the Chinese political system, as various offices and institutions strive to signal to the leadership that they are proactive. 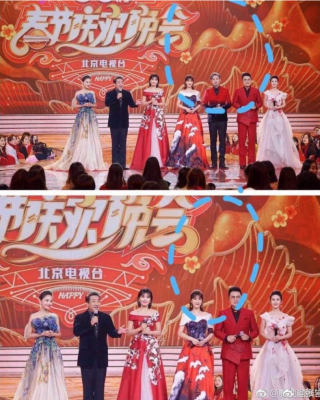 Comparing the original footage of the Beijing TV Spring Festival Gala and the edited final broadcast, one key host is found missing. Wu Xiubo (吴秀波), an actor and musician best known in China for his leading role in the television series “Before the Dawn,” was hastily removed from the pre-recorded broadcast of Beijing Television’s annual Spring Festival Gala (春节联欢晚会) after his extramarital affairs with several women, including actress Chen Yulin (陈昱霖), became public. In its broadcast on the night of February 5, Beijing Television deleted portions of the program led by prominent hosts, including Wu, and made an awkward substitution of on-screen text. For the program opening and for bridging scenes in which the appearance of the hosts was unavoidable, the network digitally removed Wu Xiubo, as can be seen from the following screenshots of the original and edited versions. At a national conference on management of programming for television and online video, held in Beijing on November 28, 2018, the National Radio and Television Administration (NRTA) emphasised a policy called the “Four No Uses” (四个坚决不用), instructing broadcasters “resolutely not to use actors whose conduct and morals are at odds with the Party” (对党离心离德), who are “coarse, vulgar or kitsch” (低俗、恶俗、媚俗), who “do not have a lofty ideological horizons and character” (思想境界、格调不高) — meaning in accord with the ideas of the Party — and who are “tainted by scandal” (有污点有绯闻). Chinese media reported on February 5, drawing on public notices from various provincial health departments, that a blood plasma product tested in Jiangxi province and manufactured by Shanghai Xinxing Pharmaceutical had been found to be contaminated with the HIV virus. The same day, the China National Health Commission (国家卫健委) ordered hospitals across the country to avoid use of the product and to monitor patients closely who had been exposed. 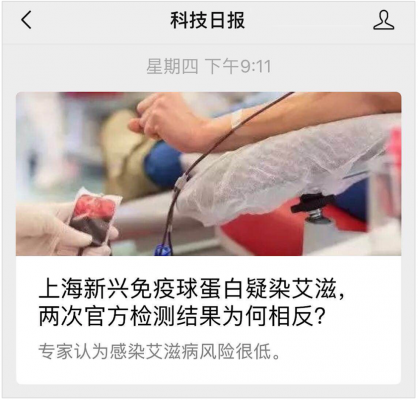 A post on the official WeChat account of Science and Technology Daily discusses the discrepancy between official tests on blood plasma products — but is deleted by censors. On February 7, the WeChat public account “Science and Technology Daily,” operated by the newspaper of the same name, quoted a health expert as saying that the positive result obtained by the facility in Jiangxi, followed by a negative result from national health authorities, suggested the issue might be “a discrepancy in detection technology yielding two results.” By February 9, this WeChat post had already been removed from the platform, but versions were available on other websites. “The Wandering Earth,” the blockbuster science fiction film epic produced by China Film Group Corporation, and based on a short story by writer Cixin Liu, was released in Chinese theaters on February 5 to a generally positive reception. As of February 7, the box office take had reached 800 million RMB, or roughly 118 million US dollars. The Xinhua Daily Telegraph, a newspaper published by the official Xinhua News Agency, said that as the country’s first major science fiction film, “The Wandering Earth” had established a strong foundation for future Chinese science fiction films. But plenty of commentators also noted the strong strain of nationalism in the film. Among such views on the film voiced domestically, that of media personality Song Jinbo (宋金波) was rather representative of the overall tone. Song said that the original science fiction work behind “The Wandering Earth” had achieved, in its measure and perspective, a kind of storytelling that evinced the notion of a “community of common destiny,” or renlei mingyun gongtongti (人类命运共同体). This phrase used by Song is an official one employed by the Chinese Communist Party since 2012, and is now a central feature of foreign policy under President Xi Jinping. But Song seemed to appropriate the official phrase to denote a quality more universal, and less specific to the foreign policy goals of the CCP. He remarked that film version of “The Wandering Earth” had gone beyond this notion of a “community of common destiny” to highlight the aspect of “national honor and shame” (国族荣辱), something the original work by Cixin Liu had avoided and in fact opposed. Xinhua Daily Telegraph (新华每日电讯): 中国科幻电影一大步 首部国产科幻大片《流浪地球》口碑票房双丰收，靠什么?